Passengers are welcome to board our ship at 6:00 p.m. After comfortably settling into your cabins, we’ll introduce our crew at a welcome cocktail. Our ship will depart for Koblenz towards 8:00 p.m. We’ll sail through the night. We’ll spend this morning sailing on the Romantic Rhine River, reaching Koblenz in the early afternoon. Join our hostess for a discovery tour of the old town. 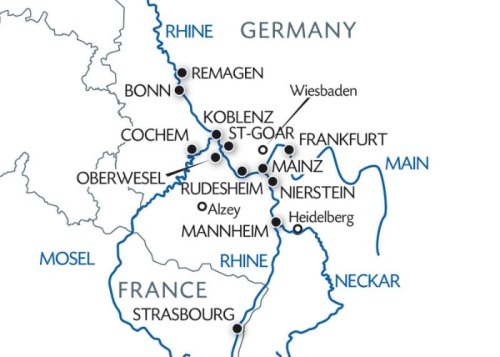 Tonight, we'll have a magical evening as we take part in a romantic and unforgettable experience: The legendary "Rhine in Flames" from Trechtingshausen to Rüdesheim. CLASSIC: Tour on a tourist train and stop at a wine tasting cellar*, followed by a visit to the Museum of Mechanical Musical Instruments. DISCOVERY: We’ll go to the center of Rüdesheim to catch a gondola lift to the Niederwalddenkmal, and hike through the vineyards. We’ll return on board and start sailing towards Mainz, reaching it in the early afternoon. Join us on an excursion for both packages: guided tour of Mainz and the Gutenberg Museum. Enjoy an evening of entertainment. The morning will be spent cruising. Join us on an excursion for both packages: Visit of Heidelberg. Its high quality of life comes through to visitors, who feel genuinely at home here. Tonight is our gala dinner and evening. Our ship will sail through the night towards Strasbourg. Koblenz: admire the "Rhine in Flames" on a glittering summer night that will light up the hillsides and surrounding castles into a magical light. Embark on an unforgettable and colorful cruise through the romantic Rhine Valley, through the Rüdesheim vineyard and the open-air cafes and the beautiful city of Heidelberg.